An unusual Nihola that was pictured on the French Nihola site. The picture above shows a special Nihola. It has disc brakes in front. 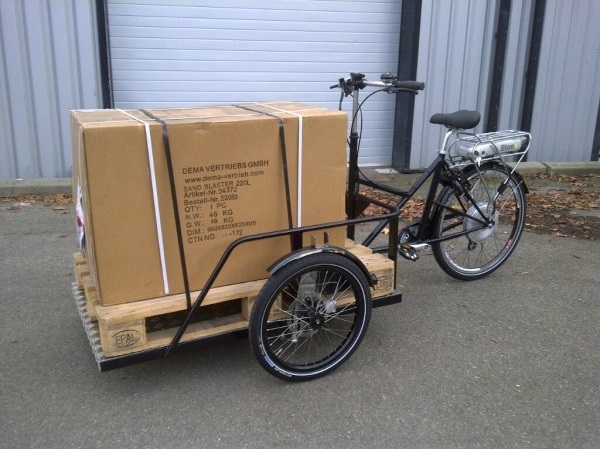 And it also is designed to carry pallets, which is a bit unusual. But about those disc brakes. Disc brakes are unfortunately not an option that be ordered on a Nihola by anyone who isn't willing to pay for custom fabrication. Its easy to see why the Nihola company selected mild-mannered and inexpensive drum brakes up front when virtually all Niholas are sold in Copenhagen, where such brakes are sufficient, even optimal. Notably the big competitor Christania Cycles does offer disc brakes, as does Bullitt. There is certainly no need for the strength of disc brakes in Copenhagen, but they look good and who knows, maybe the maintenance isn't too bad. Its a bit unfortunate, in my opinion, that the Nihola company doesn't offer to take people's money in trade for a disc brake option, because what is decorative in Copenhagen could be practical in Oslo. Its hard to photograph a hill, but this was a good one. 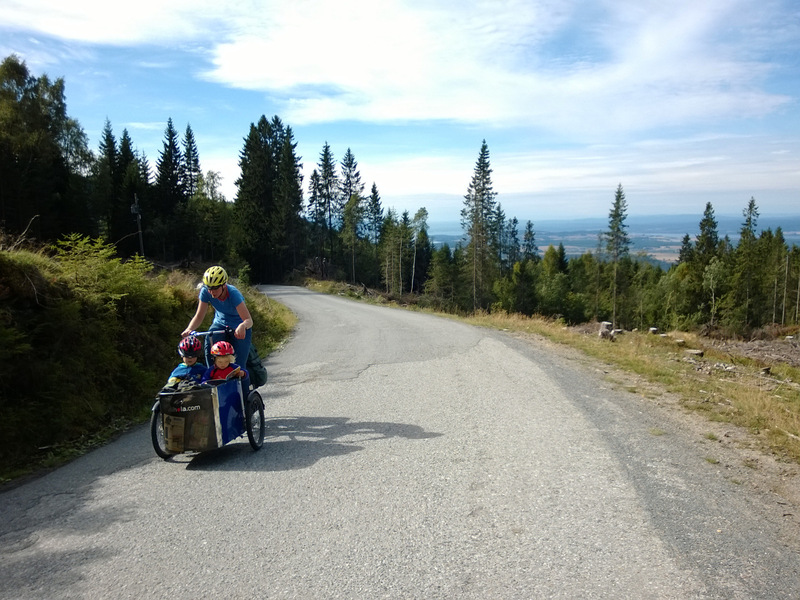 Climbing out of a valley on route from Hønefoss to Oslo. So I should talk about how braking works on a Nihola. The rear is either a coaster brake (foot brake) or a v-brake, but could in theory also be a different type of hub-mounted drum such as a roller brake (grease-filled drum from Shimano). I estimate that there is zero possibility of a disc in the rear, the lack of mounts being a prominent problem, but also the shape of the frame appears incompatible, which is a shame because all the most interesting gear hubs are available with disc mounts. Discs aren't perfect, but I'd take a disc over a rim brake on the rear wheel of a cargo bike. Now, the rear brake doesn't necessarily need to be strong. Ideally it is easy to modulate, to use whatever traction is available. Foot brakes are not known for being strong, but are more than strong enough to skid the back tire on clean pavement (presuming no weight on the rear rack). The reason that strength is not a problem is because of the significant forward weight transfer under hard braking, especially when weight is concentrated in the box, and also especially on downhill slopes. This all is to say, the rear brake is generally of little use for quick stops. This effect is more significant on a Nihola than a regular bike. Regrettably, the brakes in front are also of little use for quick stops. They are always 7cm Sturmey-Archer drums, a type of non-greased drum with a replaceable brake shoe. One single-pull 4-finger lever pulls to a splitter which seeks to distribute force evenly between the left and right, or perhaps it just seeks to keep the cables to each side the same length. There is, anyway, a splitter which has the potential to allow more cable to be pulled on one side than the other (this pulling is not smooth in my experience) and which has the potential to keep the cables to the front brakes roughly the same length. It seems to me that the observable strength of the front brakes is usually mismatched if any particular strength can be observed at all, so the splitter is not an effective way to balance braking power. The brakes, freshly adjusted, are strong enough that on flat ground, with an empty Nihola, I need to brace myself against the handlebar when doing a 100% stop. Some exertion is required, but certainly no danger of going over the bars unless I could somehow brake without having my hands on them, and certainly no possibility of lifting the back tire off the ground. Gradual and smooth is the idea. This is mostly fine at reasonable speeds and on flat ground, but hills are more problematic. By about 10% slope, I get the impression that the brakes are mostly there to prevent speed from increasing. Stopping requires planning ahead. The steeper the slope, the more planning ahead is required. 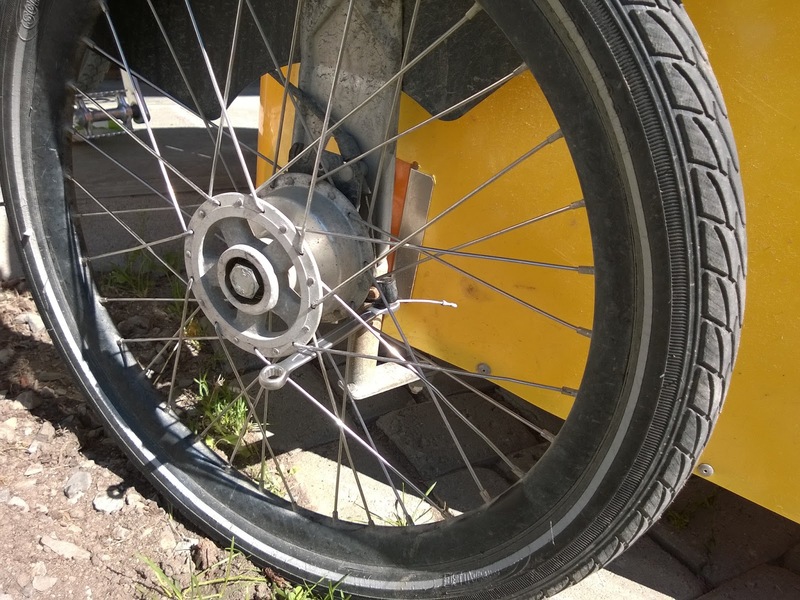 The brakes are sufficient to hold the trike in place to over 25%, which I suppose is evidence that stopping is possible at such a slope, but this will require the rear brake to be used without much skidding. A skidding rear tire is not being very helpful. Skidding the front tires is not easy to do. The easiest way is to brake hard when turning sharp corners at speed. Often, because the strength of the front brakes is likely imbalanced, this is possible turning one way and not the other. About the only other time I've managed is when one brake arm is seized up, apparently causing the other brake to gain strength, which can skid a tire on gravel. Load in the box makes skidding a lot harder. The view on a day tour. Lots of people will say drums are a low-maintenance cycle brake, but I've spent plenty of time screwing around with the drums on my two Niholas since moving to Oslo. 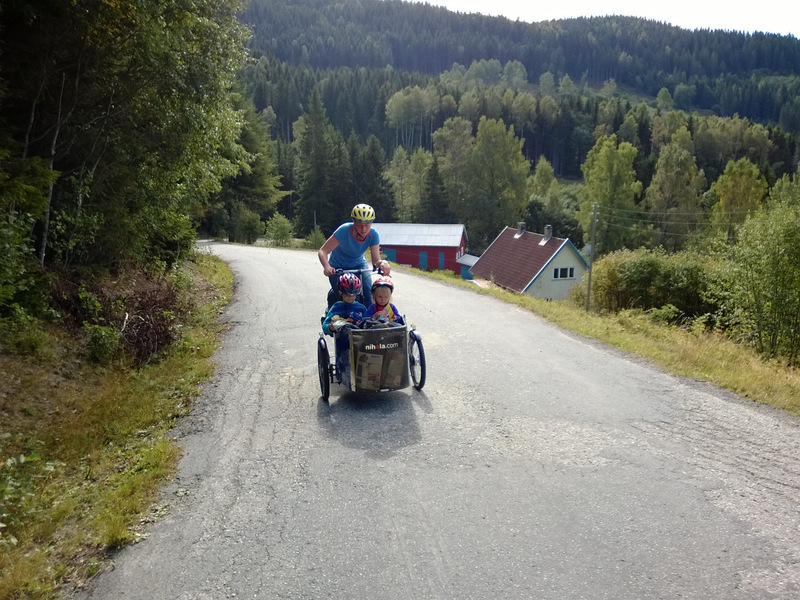 Understandably, stopping 150kg of trike, cargo and rider on some of these hills can be demanding. The brakes can easily get too hot to touch. It rains, it snows, salt and/or other chemicals are sprayed around, there is sand and gravel, mud... sometimes I get plants caught up around the brakes, and often enough they stand outside in the weather. Its true that little cleaning is required. There is no particular seal on the brakes, just a design which makes it somewhat non-obvious for water to flow in. Mostly that appears to get the job done, but if moisture enters, the brakes can be weaker while wet, and can rust a bit on the braking surface. The rust wears off but appears to contribute to lumpy and/or squeaky braking. Squeaking from the front brakes can be a major irritant, but can also be entirely nonexistant. Its difficult for me to figure out what causes the squeaking or how it can be fixed. Simply using the brakes more will only silence the squeaks until the brakes cool down again, and cleaning seems to have only a short-term effect, but sometimes the passage of time (or the change of weather) seems to change the squeaking situation. 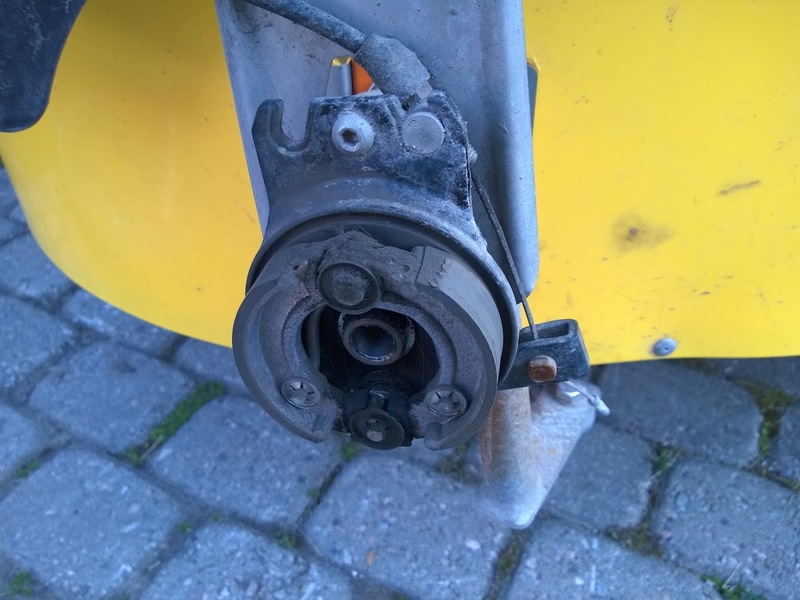 I got though months of snow and melting this winter with perfectly quiet and predictable brake behavior for no reason I can see, although there was some squeaking a week or two after I tightened up front brake cables in the summer. Squeaking is often associated with strong braking performance, but not always. There is a possibility that getting the brakes very hot encourages squeaking the next time (next day) they are used. Mysterious. The center adjuster with its rubber cover pulled up. So, maintenance. 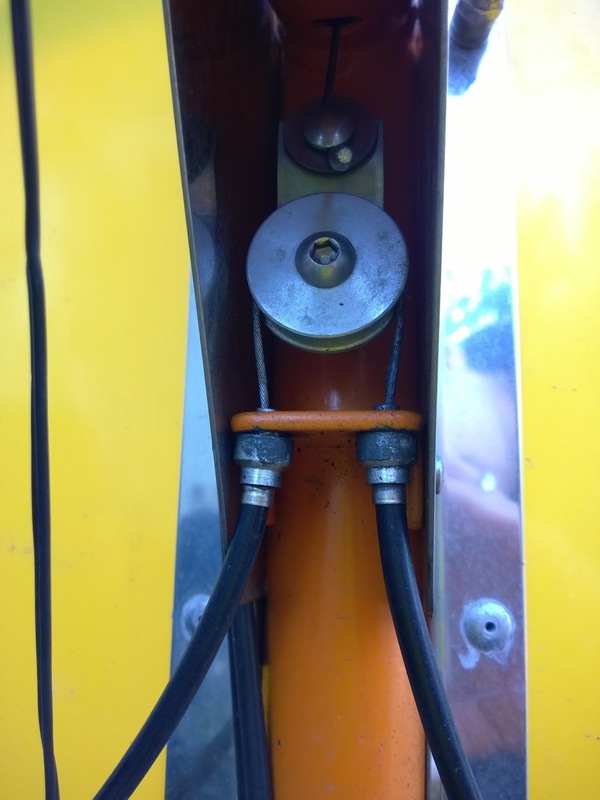 The brake arms need to be lubed (drip or spray some oil at the base) or they will start to seize up, which can have interesting effects because it may start causing all cable movement to be "routed" to the easier-to-operate brake, in a crude way. Definitely oil those arms. Brake dust might need to be cleaned out from time to time. Cable stretch and/or brake wear require the brake cable to be tightened, and this is the most interesting bit of service to perform. For small adjustments, there is an adjuster in the center, above the splitter. For big adjustments, I have found that the center adjuster should be slackened, the cable fastening bolts on each brake arm should be loosened, both brake arms should be fully engaged (full brake), and the fastening bolts should be tightened again. So the brake arms are held some distance towards engagement permanently. Surprisingly, this does not result in dragging brakes, merely a firm brake handle and optimized brake strength. A brake handle which pulls up close to the handlebars indicates that braking strength could be improved. In other words, it seems that more strength is delivered when the brakes engage early in the travel of the brake lever, even in the case of a brake lever that pulls a long way but does not touch the hand grip. I don't know why that is, but the difference can be very noticeable. The splitter, just a round thing that the brake cable is looped over. Note center cable at the top. An exposed brake, with the brake arm visible to the right. 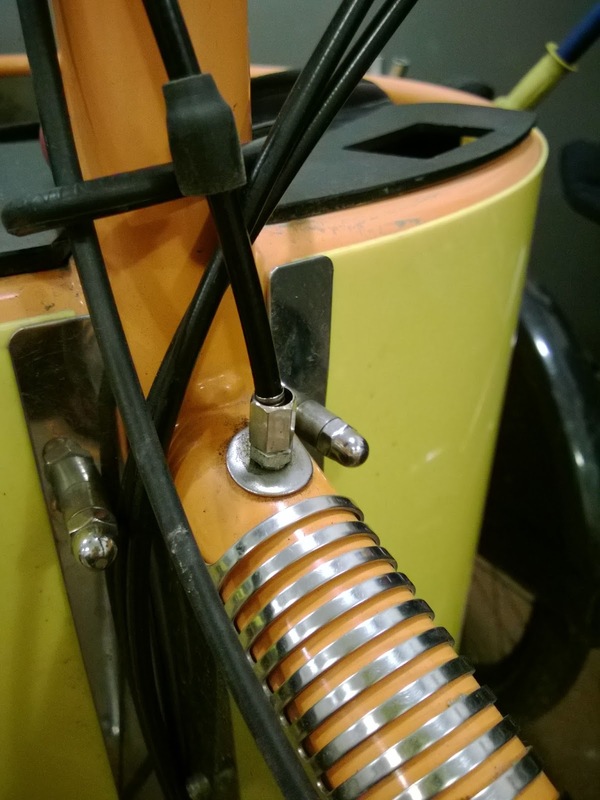 A wrench being used to hold the brake arm fully engaged while the cable on the other side is fastened. The drums behave strangely when asked to deliver 100%. The strength seems to reach a certain level fairly easily, and then does not improve further, regardless of the force applied to the brake lever. I expect that the cable liner running between the lever and the spitter has started to compress at that point. Fitting a more compression-resistant section of cable liner could improve braking strength. I've also been tempted to set up the left and right brakes with separate levers, using a foot brake for the rear. This would have the potential to be a lot of fun on downhill corners. I've noticed that Sturmey Archer makes a 9cm drum that almost fits on a Nihola, as far as I can tell from photos. Certainly the Nihola company could make it fit with a small alteration to the piece of metal that is tasked with anchoring the top of the brake's back plate and the fender. I imagine the 9cm drum would be stronger for the same cable tension, longer lasting, slower to heat, and make for a stiffer wheel (the front wheels have a hard life). Anyway the brakes on a Nihola are probably the weakest link for 'ambitious' owners. Stormy Archer now makes a 9cm right side dynamo hub (you pair it with a standard 9 cm drum on the left side). I don't know if it fits your Nihola though... but I'm not sure what leads you to believe that the normal 9cm would not fit on your Nihola. Ah, I had seen one of those on the Workcycles prototype Kr8 trike (whatever it will be called) in Amsterdam but I thought they had done something custom. Very cool. I don't have a 9cm trike hub handy so I can't do a test fit, but if you have knowledge that they are generally interchangeable, thats interesting to me. Could build some new front wheels. The spokes are working loose, one of the rims appears bent, probably need to replace the brake pads soon... hard life. Yes I have both a 7 cm and 9 cm sturdy archer trike hub, and at least the standard brake hub is basically identical except for the larger center. It provides noticeably better stopping power, but still not anything amazing. If you want I can take pictures of them side by side if you want to compare them. The dyno version is a little different, as it doesn't have a bolt going through the hub but instead comes with a bolt sticking out. So the offset might be different depending on how the bolt set up on your Nihola. Yeah a photo would be great! The dyno version isn't something I would try myself, but I wonder, do you experience the dyno hub to have high rolling resistance? I have a 9cm dyno drum on my winter bike and I suspect that it is noticeably adding resistance. I have not felt that with the standard cheap Shimano dyno hubs. Sorry for the really long delay in replying. To follow up, I don't really notice very much resistance but then again I am usually carry a large load and not going very fast. But I usually forget to turn the lights off since I couldn't tell much of a difference in resistance between them on and off. It does light up at a fairly low speed on account of the small wheel size, and due to that I am able to power two b&m led lights, one on each side plus rear light. Seems to me that 15% is a serious slope whichever way you go, but one of those new el-Niholas with the Nexus 8 ought to be able to get up that with a little help. You'd also be able to stop going down, but it would take some distance and its easy to slide the back wheel stopping on such a steep hill (so the trick then is to adjust how hard you use the back brake). Front disc brakes would be lovely for stopping on a slope like that, but then so is three wheel balance and the ability to move slowly, or stop. Great - thanks. So even if a bit hard on the up, it should be physically possible! Why did you choose the Nihola by the way, as opposed say to the Christiania? We thought about the Christania also, and actually I can't recall all the thought processes exactly, they tend to get clouded by the thoughts I have had since then. Although the brakes are unfortunate, I highly value the unified frame and car-like steering. I think the Nihola is the more athletic of the two, the one you can do the most interesting things with. Sort of halfway between Christania and say Bullitt, but in a different way than for example Kr8. Hi - we've had our Nihola electric a few weeks now and loving it. Doing about 26km a day weekdays in it (half of which with one 3 yr old). Hills, rough tracks and hills+slippery rotting leaves all navigated fine but just had some black ice one morning - I decided not to go out having tried the empty trike down a small hill and the back going all over the place. Have just read all your 'ice' stuff - not yet tried lowering pressure and weight on back - maybe that would be enough? Snow tyre seems a bit extreme for use in Southern England where these conditions are rare. Anyway - thanks for your blog which really helped inform my choice, which I'm very happy with. Glad to hear its going good with your trike! I miss touring around with small kids. Mine are too big now, mostly. On ice the front brakes, or everything at once, seems like a good idea. Also an unloaded Nihola is always a bit squirrely. I recommend adjusting your tire pressure to match the loads you carry. Handy with an electric motor that you might not notice a bit of extra drag from slightly softer tires. Thanks for the hints here. I am going to service one of these bikes on Monday. Front braking was non-existent on Thursday but I made the rear V brake much more effective after putting all the "washers" on correctly! It pays to get familiar with basic fixes for the brakes, both v-brake and drums. Definitely the greased drum options (foot or roller) are the lowest maintenance for mostly-flat places. How exactly did you mount disk brakes? I use my nihola every day and always overloaded. Front sa brakes are not sufficient and I haven't found any information on how to upgrade to disc. Thanks! I haven't mounted any disc brakes, I just had found a picture of it. The nihola store in Copenhagen couldn't even explain it. Probably there is little that can help anyone who already has a nihola, but if you ask the nihola sales/support people, maybe they'll some day take interest in the idea of stronger brakes.